If you think about it, we buy and use tools to get things done. Every tool in your tool chest represents a capability. Some make holes; others make things shorter. The tools we own define of what we can get done. One capability that was missing from my tool chest is the ability to make plunge cuts in just about any material. That's what a multi-tool is for. It was time get one. Enter the Bosch Multi-Max multi-tool. Multi-tools offer a unique cut that no other power tools are capable of. They can produce plunge cuts that are flush with an existing surface. This type of cut is immensely useful for finish carpenters and most other trades. If you have ever used a multi-tool, you'll never want to be without one. Just watch the Bosch promo video below. It shows what a multi-tool can be used for. I am sure you'll see the value of one. The Fein tool company held the patent for multi-tools for over 25 years. The Fine MultiMaster, an excellent tool, was the only option available. In 2010 the patent expired. The market opened up. Bosch, Milwaukee, Rigid, and others created their versions of the tool. Thanks to completion the consumer can now choose from a number of options. The choice between the battery and corded versions comes down to staying power. The battery versions has limited battery life, but no cumbersome chord. If you plan on using the Multi-X for trim or drywall work, the cordless versions will make it much easier to take the tool around the job site. If you are removing the grout on an entire wall, the battery version will probably run out of power before the job is done. I chose the corded MX25EK-33, because I plan on using the tool for woodworking. The corner sanding attachment will reach deeper into those corners the ¼ sheet sander just can't reach. The battery version won't last to see the end of one of my typical cabinet projects. The plastic case included with the MX25EK-33 organizes attachments in a separate compartment. The cord can placed in the case without having to coil it perfectly. There is room to spare. The case secured everything without a rattle. The tool has an on/off switch, not a trigger. Once it is turned on, it stays on. The user can use both hands to position the tool. The speed of the tool (oscillations per minute) is set with a selector wheel in the back of the tool. Once set, the setting won't change on its own. The wheel is well protected from damage. The cord is connected to the tool with a ball joint. This makes positioning the tool in tight spaces noticeably easier. I'd like to see this feature on other tools. The 2.5amp motor in this beast seems to be perfectly dimensioned. The cuts I attempted in various types of wood were all smooth, controlled, and quick. I never wanted more power from the tool. The blade is held in place with a screw. The kit includes a standard Allen key, which is used to remove and tighten the screw. To change the blade, the user has to remove the screw, change the blade, and replace the screw. This operation takes about 30 seconds. All parts involved in the changeover process are made of steel. It's unlikely that any of the parts will break before the motor does. Longevity is not a concern. Each kit comes with a different number of attachments and blades. Each type of attachment excels at a particular operation. In general, all of the attachments are of high quality. For instance, Fine Homebuilding magazine has rated Bosch blades amongst the best multi-tool attachments on the market today. They outlast and outperform the completion in most tasks. You can't do much better than what's already included in the box. The crown jewel amongst the attachments is the OSCAD1 adapter. This adapter, which is included in all versions of the tool, allows attachments with mounting patterns of other manufacturers to be mounted on the Multi-X. This is a massive benefit to the user. You can purchase any attachment you see on sale and be assured it fits on your tool. 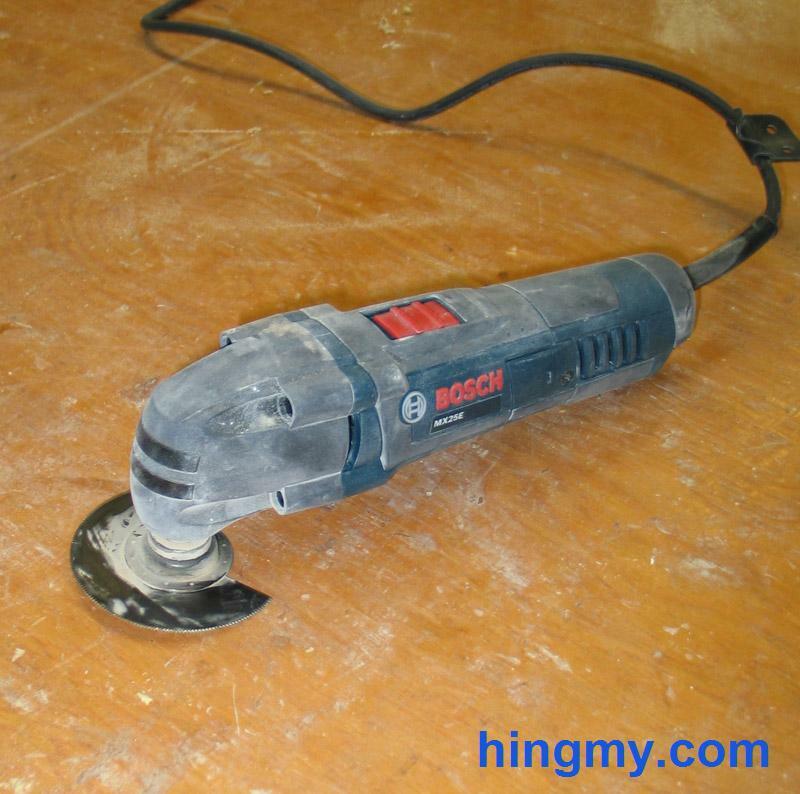 Bosch blades are a good choice, but if you see others you like or some who are cheaper, you can purchase them. Over time this adapter is going to save you money. Bosch has been very good about making the adapter available to everyone. The OSCAD1 adapter can be purchases separately. Use it on any other multi-tool gain the same benefit. Bosch deserves credit for helping all of us users with this very useful adapter. The sanding pad included in the kit is pure junk. I melted the hooks on its surface attempting to sand 1/32 off crown molding. Call me crazy, but that's not supposed to happen after letting the tool linger for 5-10 seconds. Bosch needs to do better in this area. Thanks to the OSCAD1 adapter I can choose to shop the competition. The Fein MultiMaster, the original multi-tool, still reigns supreme in this category. It is more powerful, durable, and versatile than the Bosch. It is also 2-3x times as expensive as the Bosch. Both tools are a pleasure to use and perform similarly on the jobsite. The Fein, however, has that edge that moves it into the industrial range of quality. 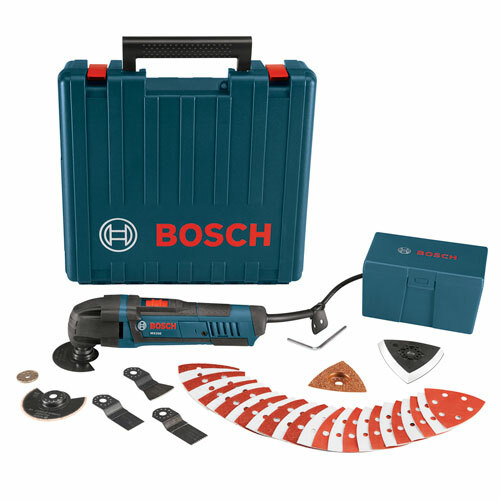 The Bosch represents a massive step forward in affordability. It performs almost as well as the Fein at a fraction of the cost. If nothing but the best will do, the Fein is the way to go. For the rest of us, the Bosch gets the job done. The Bosch Multi-Xis a contractor grade multi-tool for everyone. 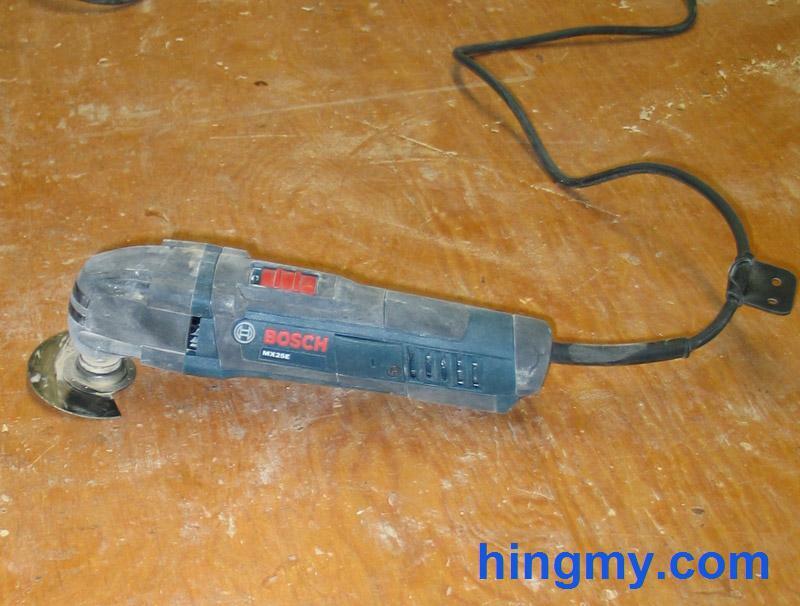 Bosch's high quality standards have made it into this tool. Adequately motorized the Bosch Multi-X powers through all jobs you'll throw at it; and it does not quit. The attachment adapter makes it possible to attach any make and model attachment to the tool. The Bosch Multi-X sits in that sweet spot where price and performance are just right. It's not going to break the bank when you purchase it, and it allows you to use the cheapest attachments you can find. The Multi-X will treat you well.